This visit is completely fiction. It had never happened. Yes, I know that Bella never talks about Edward, but this is my version. New Moon. Sometimes the choices we make, to save someone, condemn them to what we sought to avoid. To protect the one he loves, Edward must leave Bella, forever. When realizing his mistake, Edward returns to try and save his relationship with Bella only to discover that she has gone missing. Can the one mistake erase an eternity of love? Edward & Bella take an interesting ride on a roller coaster during their first summer together. But will the emotional highs of the ride carry over to their relationship? Set between Twilight & New Moon. It took one conversation to end the best thing they'd ever had, six years to stitch the wounds up, and three days to heal it all completely. Alice was so focused on Bella when she came back to Forks that she didn't see Edward's decision to go to Italy. In fact, she didn't see anything until it was too late. Bella Swan is agian pulled into the life of a vampire. When William Drake, a vampire, comes to be a new student at Forks High, what will happen to Bella as she immediatly knows what he is? When their friendship blooms and a very familiar and favorite vampire returns, what will Bella choose to do? Again, William is interesting. He clearly has been studying Bella. Can't wait to find out what his agenda is. Poor Bella is doing such a great job trying to not freak out. Good job! I would like to see how William decides to approach Bella. She's clearly skittish, he knows she knows too much, but she hasn't run screaming into the hills. That has to fascinate him. He strikes me as the thoughtful type. In terms of plot I would find it interesting for him to go on a detecting mission of sorts and learn about the wolves and Bella before he talks to her. Also, does he notice the scent of vampires in her room - can he? Summary: In the aftermath of Italy, Edward and Bella are leaving some things unsaid. Returning to the place of Bella's free fall, they try to convey both the love they feel for the other and also to try and overcome the consequences of their separation. 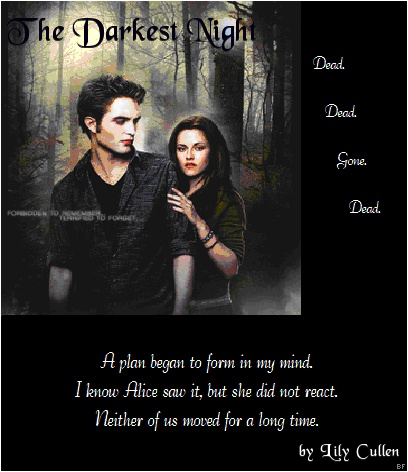 Bella jumps but doesn't survive, Edward soon follows, will they meet again? Summary: After Edward leaves, Bella was heartbroken. The only thing that helped her get through it was Jacob, her best friend. But Jacob wants to be more than just friends. But how can she give her heart to him when it's broken? And what happens when Edward and the rest of the Cullens come back? PLEASE REVIEW! It's my first Twilight fanfiction story posted. After departing Forks with the rest of the Cullen family, Alice becomes increasingly preoccupied with the information revealed to Bella by James about her life as a human and the vampire who changed her. 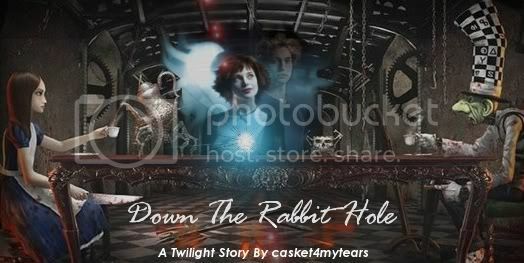 Told partially through flashback and through present-day (read: during the New Moon time span) events, Down The Rabbit Hole explores the details of how Alice comes to an understanding of her past. It's a doorway to my love..."
Bella went to the meadow seeking emotional gratification but never in her wildest imaginings did she believe that in doing so she would see two people she thought she'd never see again. Two vampires; one thirsty for her love, the other thirsty for her blood. Set within New Moon, Bella not only encounters Laurent but also Edward in that fateful day in the meadow. With the uncertainty of Edward's true feelings hanging in the air and the danger of Victoria and Laurent still wreaking havoc in Bella's life, will she ever attain real happiness again? Spoilers through New Moon to be safe. What if Bella never jumped? So Edward didn't go to Italy. What happens if when Edward came back to "check-up" on Bella, like he told himself he would, he found her in what appeared to be a happy life? What if he stayed, to watch over her as her life progressed? A protector, an angel? What if she needed him, and he came? Summary: Takes place in New Moon. What if Jacob never answered the phone? What if Bella answered the phone? What if Edward heard Bella in the background? What if Edward never went to Italy? Summary: What happens when Bella shows Edward how it was for her when he left? New Moon from Edward's POV, starting from when he leaves Bella in the forest. Her weight had dropped. She felt frailer now, more breakable. Her skin had taken on a translucent hue. It was strangely disturbing. Her previously silky hair was always now a knotted, tangled mess. Her teeth never gave her lower lip a break; It was pulsing from all the biting she'd been doing. She drank coffee in unhealthy amounts. She slept 3 hours a night. God. What have I done? Edward has to deal with the repercussions of leaving Bella. A night at home with the Cullens and Bella. Set shortly after Bella and Edward return from Phoenix after James’ attack. When Edward left in New Moon, his memories stayed. Bella didn't know, but someone else saw more. Thoughts of an inanimate object, during the 3rd chapter of New Moon. Edward and Bella's first day back at school after his 7 months away. What did Edward hear in the thoughts of his classmates? You might be surprised. Frustrated by Edward's refusal to take their relationship to the next level, Bella decides to use a little manipulation to make Edward jealous.� Her plan doesn't work, but it does have some lovely consequences. Edward made a drastic decision that haunts him throughout the night. As he watches Bella sleep, he debates on whether or not it was right. Summary: Even if my grief unloaded itself and infected every student in Forks High, there would still be enough to feed a population of starving children. When Edward left Bella, she was torn to bits without Jacob there to help her through the torture. Pure angst, both Bella's and Edward's.